All Paleogene North American Cariamae are classified in the Bathornithidae, which, following the revision of the North American biostratigraphy (Prothero 1994), occur in middle (?) Eocene to late Oligocene deposits. The first specimens of this group were described by Wetmore (1927) from the late Eocene of Colorado. After initial classification into the charadriiform Burhinidae, Wetmore (1933b) assumed that they are most closely related to the Cariamidae. The taxonomy and phylogenetic affinities of bathornithids were revised by Cracraft (1968, 1971b, 1973a) and Olson (1985). According to the former author, the taxon includes the following nine Paleogene species: Eutreptornis uintae Cracraft, 1971 from the middle Eocene (Uinta Formation) of Utah (distal tibiotarsus and proximal tarsometatarsus), Bathornis cursor Wetmore, 1933 from the late Eocene (Chadronian) of Wyoming (distal tarsometatarsus), B. veredus Wetmore, 1927 from the late Eocene/ early Oligocene (Chadronian and Orellan) of South Dakota, Colorado, and Nebraska (distal tibiotarsi, tarsometatarsi, distal humeri), "B." celeripes Wetmore, 1933 from the late Eocene/early Oligocene (Chadronian and Orellan) of Wyoming, Nebraska, and South Dakota (tarsometatarsi, tibiotarsi, distal humerus, carpometa-carpi), "B." geographicus Wetmore, 1942 from the early Oligocene (Brule Formation) of South Dakota (tarsometatarsus and tibiotarsus), B. fricki Cracraft, 1968 from the late Oligocene (Arikareean) of Wyoming (tibiotarsus), Paracrax antiqua (Marsh, 1871) from the early Oligocene (Orellan) of Colorado (distal humerus and proximal carpometacarpus), as well as P. gigantea Cracraft, 1968 (distal humerus and incomplete carpometacarpus) and P. wetmorei Cracraft, 1968 (postcranial bones of a single individual including ulna, humerus, coracoid, scapula, sternum, and pelvis) from the early Oligocene (Whitneyan) of South Dakota. Olson (1985) further identified "Neocathartes" grallator (Wetmore 1944) from the late Eocene of Wyoming and "Palaeocrex" fax (Wetmore 1927) from the late Eocene (Chadronian) of Colorado as representatives of the Bathornithidae. He assumed that both species belong to the taxon Bathornis, and that Bathornis fax is possibly conspecific with B. veredus. B. veredus was about one third larger than the extant C. cristata (Wetmore 1927). The humerus of P. wetmorei is about 1.5 times larger than that of C. cristata but is much stouter. The humerus of the largest species, P. gigantea, may have been twice as long as that of C. cristata, but judging from the stoutness of this bone, the actual size of P. gigantea was probably much more than twice that of C. cristata. Monophyly of bathornithids has not been established, and even a diagnosis covering all currently recognized taxa does not exist. E. uintae, for example, differs from other bathornithids in the craniocaudally deeper and mediolaterally narrower distal end of the tibiotarsus. Its classification in the Bathornithidae was questioned by Olson (1985), who further detailed that the species assigned to Bathornis differ considerably in hypotarsus morphology. Whereas the hypotarsus of B. veredus is simple and block-like as in Idiornis and extant Cariamidae, that of "Bathornis" celeripes and "B." geographicus is more complex and exhibits grooves and canals for the digital flexor tendons. As hypotarsus morphology usually shows little variation within closely related birds, the latter species are thus unlikely to be within the taxon Bathornis (Olson 1985). Although Wetmore (1958) described a humerus of "B." celeripes and Cracraft (1968) mentioned humeri of B. veredus, the published material of most species of Bathornis and the unnamed "Bathornis"-like taxon consists of hindlimb elements. Unfortunately, just the legs are unknown from Paracrax, which greatly aggravates meaningful comparisons between this taxon and the Bathornis-like birds. The holo-type specimen of Paracrax wetmorei is coeval with "B." geographicus and has been found in the same geographic area, and there is thus a possibility that both are con-specific. Likewise, the humerus and carpometacarpus of the smaller P. antiqua may well belong to one of the early Oligocene bathornithid species, which are known from leg elements only. At least judging from the published illustrations, I cannot discern any significant differences between the similarly sized humeri of P. antiqua (see Fig. 13 in Cracraft 1968) and "B." celeripes (see plate 4 in Wetmore 1958). The species of Bathornis had elongate hindlimbs, but detailed information on other parts of the skeleton is only available for P. wetmorei and Bathornis ("Neocathartes") grallator, which have not yet been compared with each other. P. wetmorei resembles idiornithids in the morphology of the wing bones. The sternum of this species exhibits a very bizarre morphology in that the sternal keel is greatly reduced in its midsection, similar to the condition found in the extant Opisthocomiformes. Unfortunately, sterna of idiornithids and other bathornithids were not yet found. B. grallator was first described as a flightless species of the Cathartidae (New World vultures) by Wetmore (1944) and is represented by a partial skeleton including the skull. Although portions of the latter are damaged, it was considered to be very similar to that of New World vultures by Wetmore (1944). 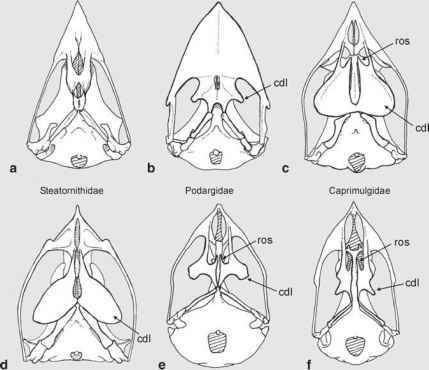 As in the Cathartidae but unlike in the Phorusrhacidae and extant Cariamidae, the prefrontal and frontal bones are fused and the former do not bear supraorbital processes. Owing to the little overlap of the preserved skeletal elements, only a few comparisons are possible between B. grallator and the species of Paracrax. However, from the illustrations in Wetmore (1944) it is evident that the humerus of B. grallator is more elongated than that of P. wetmorei, the scapula is much more curved and proportionally shorter, and the omal extremity of the coracoid is much smaller. Concerning B. veredus, Wetmore (1933c, p. 214) noted that "on examination of the two specimens of veredus now available it appears to be definitely established that the first toe was missing," whereas B. grallator exhibits a well-developed hallux (Wetmore 1944). These differences were not mentioned by Olson (1985) and certainly more research is needed before the taxonomy and phylogenetic affinities of the various species currently classified in the Bathornithidae are fully understood.